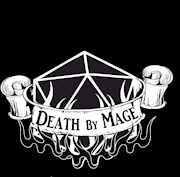 Buy Death By Mage a Coffee. ko-fi.com/deathbymage - Ko-fi ❤️ Where creators get paid by fans, with a 'Buy Me a Coffee' button. I'm a D&D/RPG blogger, game designer, and freelance writer/editor. I create various RPG content from small indie RPGs to supplements while also contributing to various anthologies & RPG books. I love writing content, whether it be for games or pieces of fiction. I've spent many years writing game mechanics, and for the past handful of years, I've taken up writing fiction too. Software and physical equipment are costly upfront; often I try to minimize accruing a massive debt and try to save up enough money to acquire them. I have a dedicated group of players who continue to play D&D and RPGs which only continues to fine-tune my craft and skills. That has opened up many avenues of creativity and ways to express them. I'm also a caffeine fiend; I drink lots of coffee and tea to keep myself functioning into the late hours of the night before waking up early in the morning for my day job. A lot of the funds provided here will help pay for said caffeine-enriched beverages, but it helps me acquire artwork for gaming supplements I write. I often wish to include artwork in the pieces which costs money as artists want to to be paid too. I want to pay these artists for their work, but I am limited to whatever budget I have to go on. The average art commission (especially if it is a character art) runs about USD 50+, meaning it will take me longer to acquire the art pieces for more solid game materials such as guides and primers. I would love to build more content and provide improved quality of my services and products, but I can't do it without your help. Thank you for your support! Secured Payments. Support goes to Death By Mage's account. Contributing to this art fund will go towards the following projects: - Vampire the Masquerade book - Legacy of the Windrider D&D Adventure (part 2) All contributors will be credited in both products. Thank you for your support! Upgrade Death By Mage to a yearly Gold Membership with a one-time payment.